WHAT SPECIAL INTEREST is spending the most money to influence the 2010 election? The answer isn't the US Chamber of Commerce, notwithstanding President Obama's recent attacks on the Chamber's campaign contributions. Nor is it the Karl Rove-backed network of pro-Republican campaign organizations, including American Crossroads and Crossroads GPS, that have also been assailed by the White House and the focus of critical media attention. In reality, the biggest outside spender is the American Federation of State, County, and Municipal Employees, which is pumping almost $88 million into TV commercials, phone banks, and mailings to promote Democratic candidates. 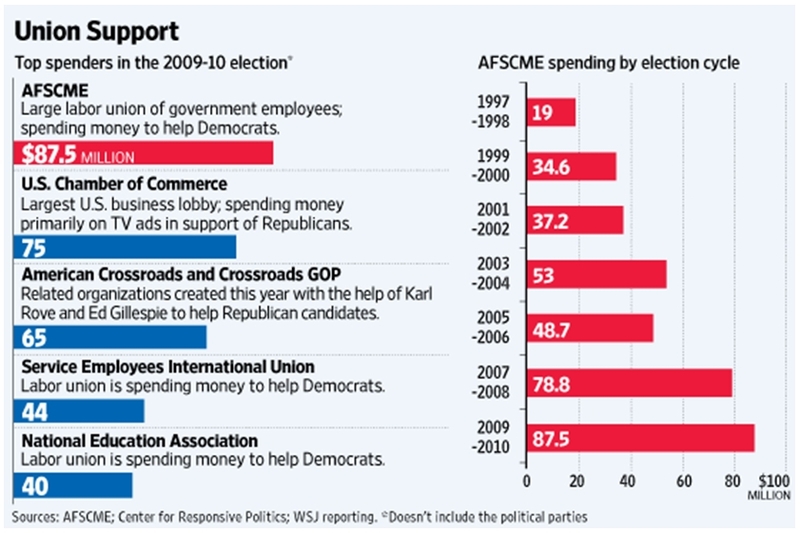 "We're spending big," AFSCME President Gerald McEntee boasted to The Wall Street Journal. "And we're damn happy it's big. And our members are damn happy it's big -- it's their money." 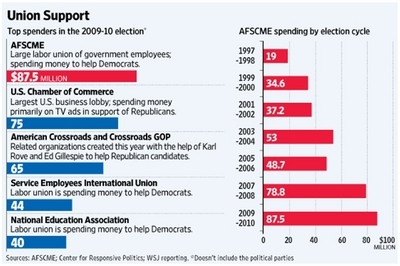 AFSCME isn't the only public-sector union "spending big" to influence the vote on Nov. 2. So is the National Education Association (NEA) and the Service Employees International Union (SEIU), respectively the nation's largest and fastest-growing unions. Together, the three government-employee unions will have spent nearly $172 million campaigning for Democrats in the course of this election cycle. That outstrips by more than $30 million what the Chamber of Commerce and the Rove network combined are pouring into the 2010 campaign. I have no objection to close media scrutiny when business-linked organizations spend heavily on campaign ads. But it should be a far bigger story when public-employee unions do so. Indeed, it should be serious cause for concern. "It's their money!" the president of AFSCME declares, and the heads of the NEA and SEIU would presumably agree, but where does "their money" come from? From satisfied customers paying for goods and services they voluntarily purchased? From profits earned by building better mousetraps, designing safer cars, serving tastier meals, developing cleaner fuels? From investing prudently in the marketplace? From risking their savings to launch a new company -- or to keep a going concern competitive? Of course not. Every dollar the government pays its employees is a dollar the government taxes away from somebody else. As it is, public employees generally make more in salary and benefits than employees in the private economy: For Americans working in state and local government jobs, total compensation last year averaged $39.66 per hour -- 45 percent more than the private sector average of $27.42. (For federal employees, the advantage is even greater.) Which means that AFSCME and the other public-sector unions are using $172 million that came from taxpayers to elect politicians who will take even more money from taxpayers, in order to further expand the public sector, multiply the number of government employees, and increase their pay and perks. Campaign contributions from public-sector unions, National Review editor Rich Lowry writes, drive "a perpetual feedback loop of large-scale patronage." Not only don't the unions deny it, they trumpet it. "We're the big dog," brags Larry Scanlon, the head of AFSCME's political operations. "The more members coming in, the more dues coming in, the more money we have for politics." Unlike labor unions in the private sector, government labor unions can reward politicians who give them what they want and punish those who don't. The United Auto Workers has no say in hiring or firing the president of the Ford Motor Company, but public-sector unions like AFSCME and the NEA can use the political process to help elect the "management" that will have to negotiate with them. The unions flex their political muscle to push not only for ever-more-lavish wages and benefits (including the exorbitant pensions and health plans that are devouring government budgets), but also for more government hiring and bigger government programs. The cost of government has thus soared in tandem with the growth in public-sector unions -- and those unions make no bones about their reliance on politics to enlarge their wealth and power. "We elect our bosses, so we've got to elect politicians who support us and hold those politicians accountable," AFSCME's website proclaims. "Our jobs, wages, and working conditions are directly linked to politics." That is exactly the problem. Public-sector unionism has been unhealthy for American democracy. The power to "elect our bosses" has turned government employment into a rigged game -- rigged in favor of ravenous government growth and against the private-sector taxpayers who pay for it. 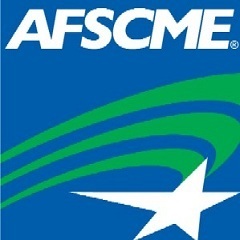 AFSCME may be "damn happy" at the impact it has on US elections. But the rest of us ought to be alarmed.